Farmers’ markets are venues to learn about fresh, local, in season foods and they serve as springboards for local farmers and makers to introduce their wares to new audiences. They are places to connect with friends, family and neighbours and celebrate the uniqueness of each community and region. Shop Local. Support Local. Eat Local. People come to farmers’ markets week after week for many reasons, including the community gathering experience, the opportunity to talk directly to farmers, and the reassurance that they are eating fresh, locally sourced food. By shopping at the farmers’ markets, you are directly supporting farmers and other local businesses. Every dollar goes to local growers, makers, bakers and strengthens the local economy. 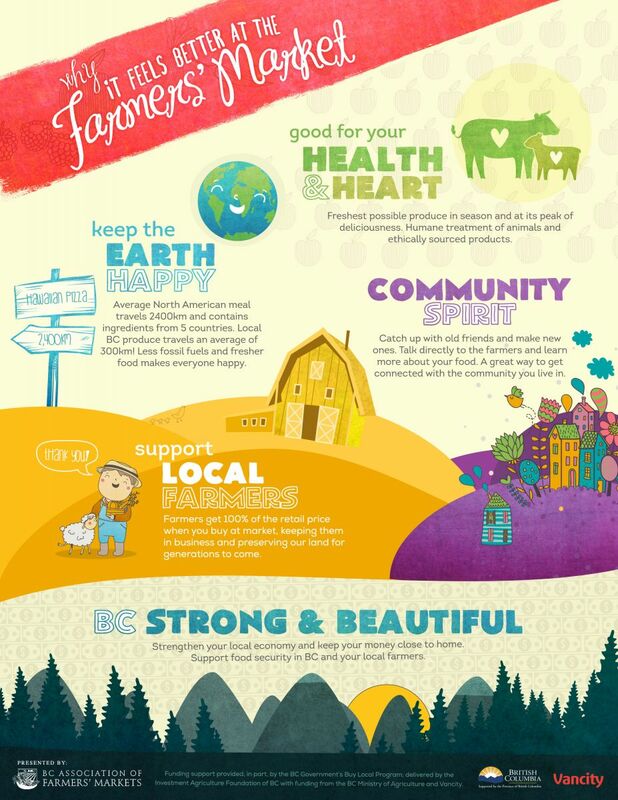 By purchasing direct from farmers, you are voting with your dollar to support small, local growers, and safeguarding BC’s foodlands for future generations. The fresh produce sold at BC farmers’ markets usually travels less that 300km to get to you. Compare this to the average North American meal, which travels 2,400km to get from field to plate and contains ingredients from five countries in addition to our own. BC farmers’ markets are the go-to spot for fresh food direct from local farmers, and one of the only places you can meet and talk to the people who grow your food. Find the freshest fruits and veggies, locally raised meat and eggs, artisanal cheese, preserves, honey, craft beer, wine and spirits, savoury treats, handmade artisan goods and more.